Only when it is a brand new year I realize how fast time flies. *laughs* 52 weeks in a year and now we are almost done with 2 weeks! O_O gah! I set more carefree resolutions this year as seen above....*laughs* Self improvements/bigger achievements are supposed to be made (slowly bitbybit) daily like habit anyway, no need to write resolutions for it....I think? 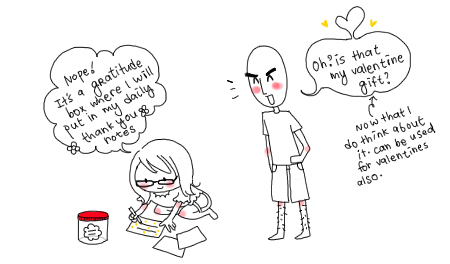 ^^"
I will write one thing I am grateful for everyday. (It's also a good excuse to doodle :P) and put all into the "box." 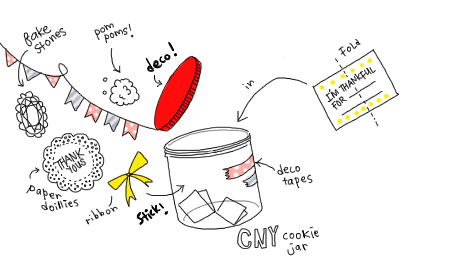 I saw on websites that usually nice jars are used but since I am supposed to save quite a sum of money this year *uh-hm* ciplak CNY cookie jars are RM1.80 somewhat and I can just deco it to the max la! Hey, that's a very good for self improvement! Yea, we must be grateful of what we have! This is my first visit around, to stumble on this meaningful post. I found your comics so cute! I wish i was someone who can draw, lol. following via nuffnangx for more cute comics! Hi there! It was nice talking to you today! The way you talk is just like how you draw/write in your blog. Hahaha.. I like the thankful notes box idea! 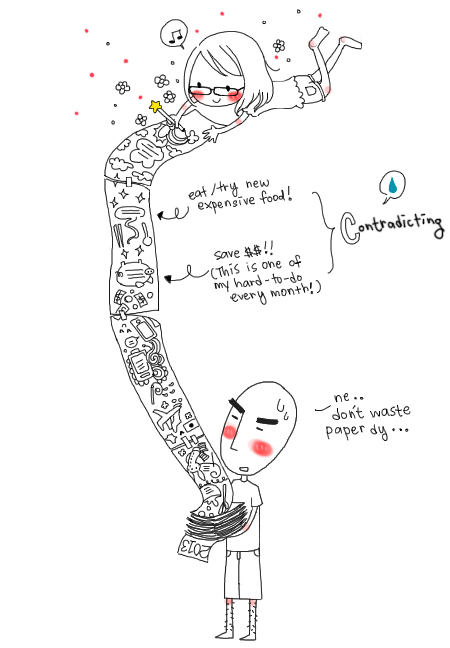 Think I should do that to remind meself of the good things in life..
Caroline Ng May Ling : But almost killed me leh! lame max! cheryl chan : pls do!! it would a good self present at the end of the year haha! i believe! Ras : ^^ super ah pek! Ku-ru: haha ah pek or me!! Sijun: hello June! Gah. such a late reply to u!! T_T It was fun&lovely talking to you! Made my day a lot! Hope Yoshi did wonderful magic to your hair haha!